The Kawa (river) model has been developed by Michael Iwama and it is FREE (yes, all students love the word free) to use and he wants to spread the word about it. That’s why I’m writing this post. So, please if you are interested in knowing more, please visit his Facebook site and website. Links are at the bottom of the page. Firstly, although useful to know for OT’s, if I was working with a patient, I wouldn’t call it the ‘Kawa model of OT ‘unless they asked. What matters is whether it is useful. I’ve seen people tense up when I say that I am going to do the Kawa river, they joke that I’m going to throw them in a lake, but you can see that they are apprehensive because they don’t know what I am going to do with them. I would call it ‘the river of life exercise’ or something similar, but that’s your call. I’m going to explain it to you, the way that I would explain it to a client, in case readers would like to have a go at creating their own river. The river of life is a way of stepping back from everyday life and looking at your current situation and where you want to be. It looks at how you want to live your life so that you feel better well-being. Rocks: these are your current life difficulties, fears or concerns which block and slow down the water in your river of life. The river walls and base is your environment. Our environment gives the river its shape. These can be things like; who you live with, the important people in your life, where you live and work, your family, healthcare professionals, schools, workplace and our culture. These all make a difference to our life. The driftwood in the river are your values, personality and personal resources. Sometimes these can help you and sometimes they can hinder you. The driftwood can further block the water or bump the rocks away, enhancing the flow. The spaces between represent your overall satisfaction with your life and the things that make you happy with your life: these are our occupations. The more spaces there are the more well-being you feel as your water can flow easier. These are opportunities to make your life better. Break the rocks: remove the obstacles or make them smaller. Maximise the spaces: accentuate the positive, do more of the good things that you enjoy or the things that you feel help you. Use the driftwood: use your personal qualities or things that you already have to improve your situation. Widen the river bed walls: change or modify your environment. This could be where you live, work, the people that support you and where you go in your leisure time. The therapist and client would draw the river together, see the above picture from Michael Iwama. During stressful times in my life, I have also drawn my own river which I have found helpful. You can draw past, present and future rivers. 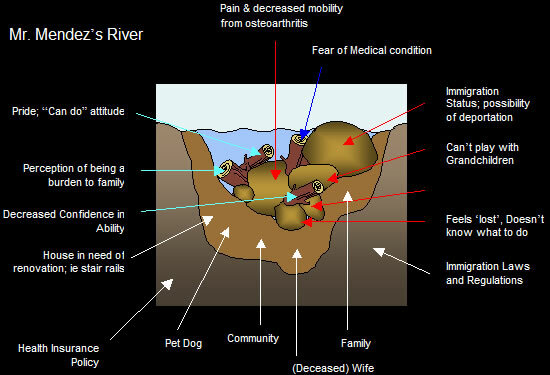 The river can be drawn at a later date so people can see how far they have come and you can see whether the treatment has been effective. What do you enjoy doing? Why do you enjoy it? What makes you happy? How does it make you happy? Why? Have you experienced any significant changes in your life recently? How do you typically go around doing your everyday activities? Are you having any difficulties right now? What are they? Why do you think (those things) are difficult for you? How is it difficult? Do you have anything in particular that you would like to do but you are unable to do because of your current situation? Why do you think you are unable to do them? How are these things typically done? How is doing them right now different from back then? What would you like to be able to do? Is there anything about your life right now that you would like to change? What is it? Why? How would you like things to change? If things were better, what do you think would be different? Who are you currently living with right now? Who do you typically spend most of your time with? How do you spend your time with them? What do you usually enjoy doing together? Where do you typically spend most of your time? Think about the place where you live / work? How do you find your ability to get around there? Do you live in a single storey / double storey terrace / apartment / flat / wooden house? Is your room upstairs or downstairs? Are there lifts? Driftwood can be personal traits or characteristics – like what some might call “personality” traits or “attitude”. E.g. “stubborn”, “likeable”, “sense of humour”, “addiction”, “pragmatic”. Driftwood can also be special skills, abilities and experiences. Maybe you are good at sports, maybe you have a specialized education or trade, maybe you are good with people, sociable, good with your hands, artistic, etc. Driftwood can represent material and/or social capital, such as financial wealth and access to money as well as social connections to others who hold power/influence. 1. How do you see challenges in life? 2. How do you typically cope with stress? 3. How would you describe yourself? Why? 4. Do you have any special skills or abilities? Guiding questions taken from:The Kawa Model Made Easy A Simplified Guide to Applying The Kawa Model to Occupational Therapy Practice. Teoh J. Y. & Iwama M. K.
A great video that explains Kawa in a simple and effective way. Brilliant Blog Post, The OT Process! Thank you for conceiving this and sharing it with the world! You wrote early on that you wanted to write about the Kawa Model without getting too technical and that you intended for this post to appeal to service users, prospective students, students and OT’s alike. I think you’ve achieved your intentions very well. As the originator of the Kawa Model, I fully concur that: “an OT should always be armed with ‘client friendly’ definitions of occupational concepts to be able to explain it easily to service users.” After all, it should all be about the service user and what they need to experience well-being in everyday life (shouldn’t it?). Each service user has a unique story to tell about their experience in daily life. An occupational therapy that can respond to that story and provide relevant and meaningful help (to help their river flow better) is a powerful and useful occupational therapy. The Kawa Model was developed in response to a need for an OT model that could be understood and used by both therapists and service users. The river metaphor becomes a vehicle of communication and mutual understanding of the service user’s experience of daily life and how occupational therapy can help in a positive way. As you pointed out, when the service user becomes the ‘theorist’ and builds a model (to explain their daily life circumstances) with words and ideas that they ‘own’, and the OT becomes a student of the service user’s “model”, the chance for OT to make a meaningful contribution to the service user’s life is enabled. The OT Process really ‘gets it’, and I am elated that you chose to blog about the Kawa Model! Excellent post! Easy to understand and to the point. OT from UK in NZ! Thank you for your positive comments, I appreciate them-especially as I am so early on in my blogging career. I would be interested to know how people use Kawa in their OT practice. Thanks for reading the OT process and look forward to more discussion with you all. Awesome post! I have been using Kawa as I complete my Capstone for my OTD. I am using it with mothers of lower socioeconomic status. Many of these mothers have experienced domestic violence and/or sexual abuse, abuse drugs or alcohol, have not earned their high school diplomas, and are unemployed. I use it as an evaluation tool to better understand the client’s context and set goals that are very client-centered. I feel the Kawa model is an AWESOME way to holistically understand what is going on in a person’s life. I have also used in inpatient mental health during a group on coping skills. I love it! Brilliant, great explanation of the Kawa Model. Hello Helen! I’m an occupational student and This amazing post was really helpful for. I have some questions to you so please tell me how can I contact you? Hello Helen! I’m an occupational student and This amazing post was really helpful for me. I have some questions to you so please tell me how can I contact you?